Journalist Alexandra Witze was one of two winners of the EGU’s first Geosciences Communications Fellowship. 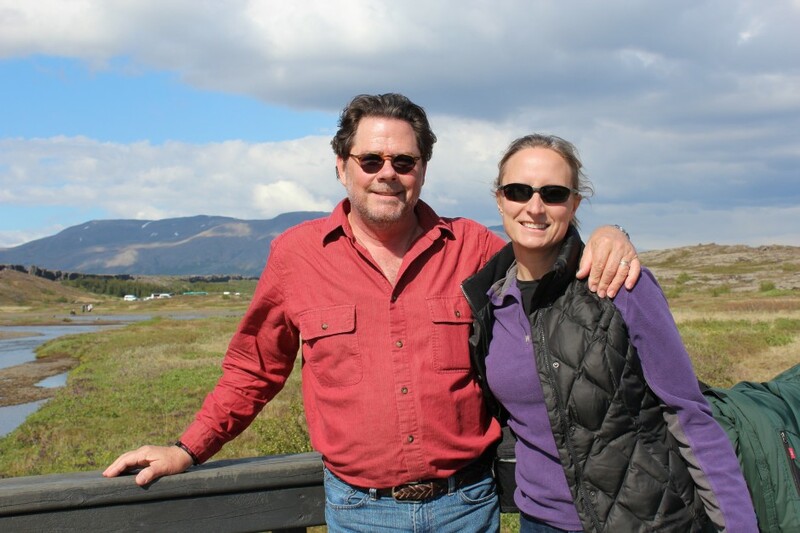 We asked her to report back from a recent trip to Iceland, where she and her husband, science writer Jeff Kanipe, were gathering material on the 1783 eruption of the volcano Laki. They are working on a popular book about Laki for Profile Books. When you’re hot on the trail of a particular Icelandic eruption, it’s hard not to get distracted by all the other volcanoes that dot the landscape. Just driving east from Reykjavik is like volcano overload. There, off to the left, is mighty Hekla, its snowy slopes rising dramatically. Up ahead is infamous Eyjafjallajökull, its shoulders still dusted with the dark ash that closed European airspace for a panicky week in spring 2010. 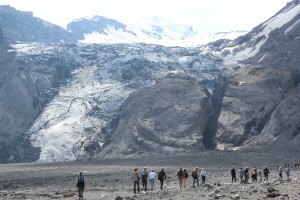 And just behind that lies a massive ice cap smothering one of the island’s most active volcanoes: Katla. It was this volcanological bounty that led the American Geophysical Union to hold a Chapman conference on volcanism and the atmosphere in the town of Selfoss in June. We attended all week, eager to learn about how Laki fit into Iceland’s violent past. On a field trip to Eyjafjallajökull, Thor Thordarson of the University of Edinburgh told the group how the eruption sent a glacial flood, or jökulhlaup, bursting from beneath the mountain’s ice cap to carve a devastating path to the sea. On another trip to Thingvellir National Park, we watched as workers repaired the visitor’s pathway that had been destroyed by the North American and Eurasian tectonic plates pulling apart — just another casualty of building right on the Mid-Atlantic Rift. We also learned how Laki’s 1783 outburst fit into the history of other climate-altering eruptions. For eight months the ground literally ripped open, sending fire fountains spurting along a fissure that eventually stretched for 27 kilometers. It was one of the biggest lava flows in historical times, and it pumped some 100 million tons of sulfur dioxide into the polar jet stream above Iceland. Those acidic fumes soon spread across Europe, killing crops and choking people.Particles spewed by Laki also reflected more sunlight back into space, cooling much of the Northern Hemisphere. Shivering in Paris in the winter of 1784, Benjamin Franklin and others proposed that an Icelandic eruption was to blame — the first scientific recognition that a volcano could cool climate. At an impromptu session on Laki convened the last day of the Chapman conference, Stephen Self of the Open University and others talked about how future computer modeling could resolve questions over how much of Laki’s aerosols made it to the stratosphere, and how many weird weather events in 1783–1784 can be blamed on it. Within Iceland, the effects were obvious. Poisonous fumes including fluorine settled on the grass, killing livestock in a national disaster known as the “mist hardships.” One-fifth of all Icelanders died in the barren aftermath, many from starvation. Two and a half hours east of Selfoss, the town of Kirkjubæjarklaustur was ground zero for this misery. Here a local priest named Jón Steingrímsson kept a grim census, recording the deaths of his parishioners one by one. Today his chronicle, known as the Eldrit or Fires of the Earth, is the main source of detailed information on the Laki eruption. 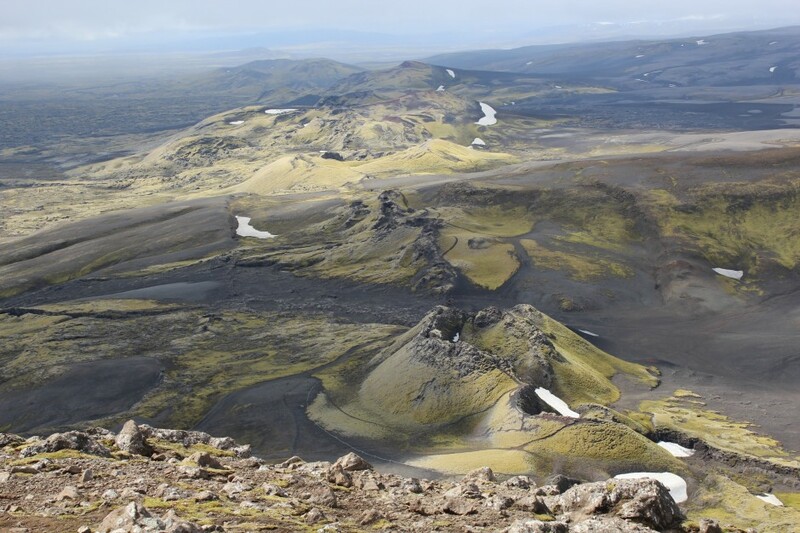 Steingrímsson was also a proto-volcanologist, and he carefully observed how layers of ash settled over the landscape and how lava traveled down the gorge of the Skafta river. Six weeks after the eruption began, when it looked as if flowing rivers of fiery rock would envelop the village, Steingrímsson famously led his spiritual flock into the church and prayed for deliverance. 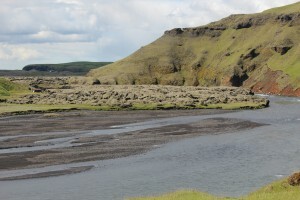 When they emerged they saw that the lava had miraculously stopped, just upstream from the village. Or so the story goes. In reality, many of the experts we met say, Steingrímsson had been paying close attention to the lava, and he recognized that it would likely halt at the place where there was enough water to cool the flow and halt its advance. It was perhaps the earliest and most brilliant public-relations move by a budding volcanologist. 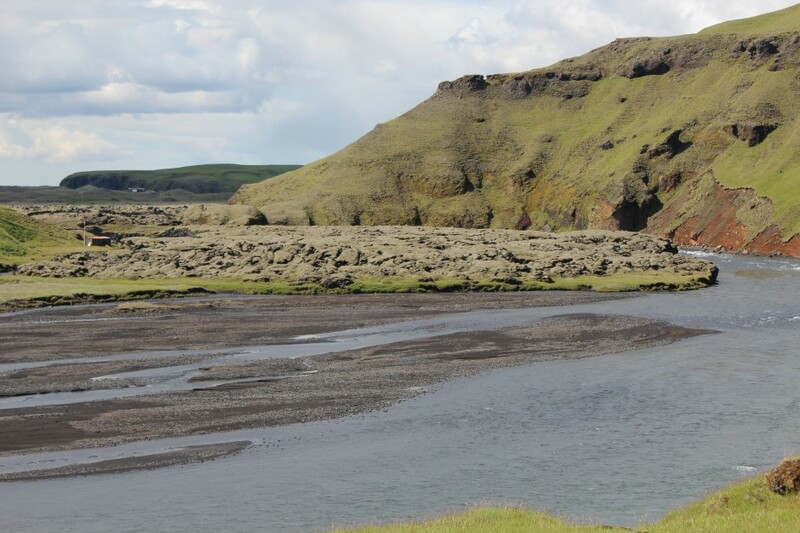 Thanks to the help of the EGU fellowship, we were able to visit the row of Laki craters and the village of Kirkjubæjarklaustur, where we stayed directly across the street from the ruins of Steingrímsson’s church. A simple white cross in the courtyard still commemorates the famous fire mass. Steingrímsson himself is buried at the site along with his wife, who died in the mist hardships. In one corner of the churchyard lie yet more victims of Laki, piled by the dozens in a mass grave. Most tourists driving through this town stop briefly to fuel their cars and get a bite to eat, unaware that modern volcanology took some of its first tentative steps here. Other experts graciously shared their knowledge of Laki with us. Two hours north of Reykjavik, the volcanologist Haraldur Sigurdsson showed us around his excellent volcano museum and told us how glass inclusions in Laki rocks preserve chemical evidence of its high sulfur content. 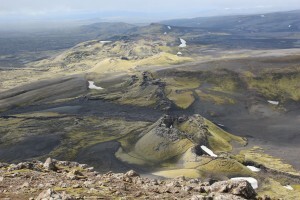 At the University of Iceland, historian Sveinbjörn Rafnsson walked us through how poor rural farmers would have coped with devastating 18th-century eruptions. We returned home from Iceland with a bulging notebook, more than 1,000 photographs, and as many Laki souvenirs as we could find. Now our task is to tell the story of this amazing eruption. Having read Reverend Jón Steingrímsson’s account of the Lakagígar eruption, as well as his autobiography, I consider it extremely unlikely that his “fire sermon” was meant to be a “public-relations move by a budding volcanologist”. Although Jón was certainly a keen scientific observer, his first and foremost motivation were his “priestly duties”. He would not play a trick in his church: not to promote science, and not even to promote Christian faith. He did, in retrospect, figure out that the lava had been cooled by rivers, but I think he still saw this as a divine intervention: God had used the cooling water to halt the lava. I also do not think that Jón had foreseen that the lava would stop. 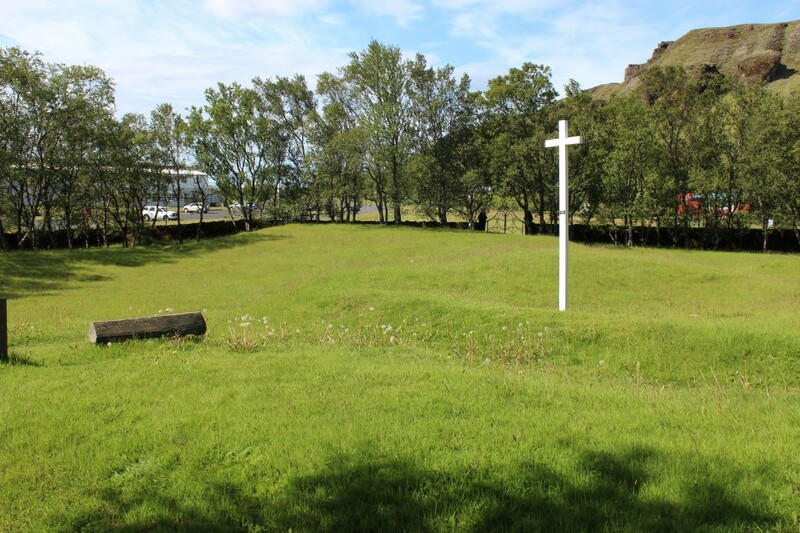 In his report “Fullkomið skrif um Síðueld (Complete description of the Fires in Síða)”, he wrote: “[On July 20th] I proceeded to the church […] I was filled with sorrow at the thought that this might well be the last service to be held at this church, as the terror […] appeared likely to destroy it […]”. In case you argue that this publication was part of the “public-relations move”, let me add that in his autobiography, which was not intended for publication and in which he was very frank and honest, there is no hint at any such tricks. Instead, it is full of stories of Godly interventions. For example, when his wife died in the midst of the Lakagígar famine and one of his labourers surprisingly caught a lot of trouts in a river, Jón believed that God had performed a little miracle so that he had some fish to offer to the funeral guests. Reverend Jón Steingrímsson was an intelligent man with a great interest in natural phenomena, but above all, he was a Lutheran parson greatly influenced by pietism. This worldview may often be hard to understand in modern times (at least I struggle with it), but I don’t think Jón would have performed spectacular scientific outreach stunts in church.